To endow computers with common sense is one of the major long-term goals of artificial intelligence research. One approach to this problem is to formalize commonsense reasoning using mathematical logic. 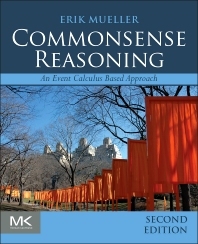 Commonsense Reasoning: An Event Calculus Based Approach is a detailed, high-level reference on logic-based commonsense reasoning. It uses the event calculus, a highly powerful and usable tool for commonsense reasoning, which Erik Mueller demonstrates as the most effective tool for the broadest range of applications. He provides an up-to-date work promoting the use of the event calculus for commonsense reasoning, and bringing into one place information scattered across many books and papers. Mueller shares the knowledge gained in using the event calculus and extends the literature with detailed event calculus solutions that span many areas of the commonsense world. The Second Edition features new chapters on commonsense reasoning using unstructured information including the Watson system, commonsense reasoning using answer set programming, and techniques for acquisition of commonsense knowledge including crowdsourcing. Researchers and graduate students in the areas of cognitive science and artificial intelligence.